Formed in 2011 Duo de Vista has quickly become a passionate duo, engaging audiences across the U.S. with a wide variety of repertoire. 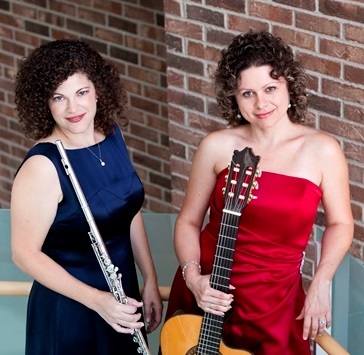 The founding members, flutist, Teri Forscher-Milter and guitarist, Marina Alexandra, have been recognized in recital at universities, festivals, and concert series across the United States. Duo de Vista remains a dynamic chamber ensemble in the southeast, focusing on artistic expression and audience immersion. Teri Forscher-Milter is a highly accomplished flutist, expressive performer, and a winner of the 1994 Presidential Scholar in the Arts. As a recipient of the first prize at the prestigious Arts Recognition and Talent Search Competition in Miami, Florida, Teri was subsequently named Presidential Scholar by the National Foundation for the Arts. She was honored by President Clinton for her playing in ceremony held at the White House following her performance at the Kennedy Center for the Arts. The National Foundation for Advancement in the Arts invited her to return to Washington D.C. as the featured artist in 1995. Teri studied at the Cleveland Institute of Music with Joshua Smith from 1994-1999 and received the Maurice Sharp Flute Award at the Blossom Music Festival in 1996. As a founding member of the Juniper Wind Quintet, she was awarded numerous prizes, including the Fischoff National Chamber Music Competition in 1999. At the young age of nineteen, Teri was named second flutist of the American Sinfonietta and played with the orchestra for six years. She was also featured on Seattle Public Radio in concert as flutist for the orchestra. Teri was named principal flutist and soloist of the Knoxville Symphony in 1999 and has also performed with many U.S. orchestras, including the Cleveland Orchestra and the Atlanta Symphony Orchestra. Forscher-Milter is also an active educator and musical coach, having held several teaching positions at musical institutions across the U.S. She is also an advocate for young musicians in the area of injury prevention. In 2002, Teri was diagnosed with focal dystonia, a neurological condition affecting two fingers on her left hand. In 2006, she returned to playing with a modified flute and continues to play with eight functioning fingers. Marina Alexandra has established herself as a dynamic performer with a powerful stage presence. Finger Style Guitar Magazine described her as an “amazing player that commands the guitar with world-class technique and musicianship that is uncommon." She has received awards in several guitar competitions, including the Music Teachers National Association State and Regional Competitions and semifinalist in the 6th annual Edwin H. and Leigh W. Schadt National String Competition for classical guitar. Marina has a concert career spanning the last fifteen years, taking her to Piccolo Spoleto Festival, National Public Radio, Allentown Radio, and hundreds of venues including colleges and museums throughout the U.S. She has released two albums including; Timeless Enchantment (Baroque, Classical, Modern, and Latin-American music) and A Moment of Magic (modern music by Russian composer, Nikita Koshkin). Her last CD received high praises from such prestigious music magazines as Soundboard, Classical Guitar (UK) and American Record Guide. Marina Alexandra was born in the Ukraine, where she began her guitar studies at the age of six. In 1996 she immigrated with her family to the United States, and in 1998 she was awarded an assistantship to earn her Master of Music degree at the University of South Carolina. She has served on the faculties of Furman University, University of South Carolina- Aiken, SC, Wingate University, and Columbia College. Marina is both founder and director of the Guitar Muse Society and the Southern Guitar Festival and Competitions. Her foundations have given opportunities for young guitarists to learn and compete in the southeast and around the entire United States.